Unless otherwise stated on this invoice, seller warrants to original customer that all parts and labor included in this invoice shall be free from defects in workmanship and materials for a period of two years from the date of this invoice or 25,000 miles, whichever comes first, excluding commercial or modified vehicles, which will carry a six-month, 6,000 mile warranty. Any covered part of labor found to be defective within this period will be repaired or replaced at the option of Art Morse Auto Repair. Warranty excludes maintenance and wear items. This “auto repair or replacement” warranty is the only warranty provided. 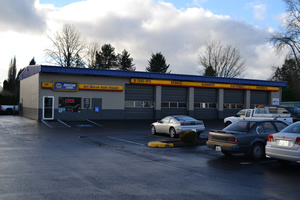 All work under this warranty must be performed by Art Morse Auto Repair with the exception of the nationwide NAPA AutoCare Peace of Mind Program and unless advance authorizations granted for third party repairs. Cost of repairs or replacement performed by “others” and authorized by seller under this warranty will be limited to the cost of original repair under which this warranty was established. Seller expressly disclaims any and all other warranties including any implied warranty of merchantability or fitness for particular purpose. The customer’s exclusive remedy of breach of warranty is limited to repair or replacement of defective part or labor. Seller shall not be liable for claims in incidental or consequential damages, lost profits, rental cars or towing expense. This warranty is not transferable when vehicle is sold. No warranty of any kind is made for auto repair parts supplied by the customer. All vehicles left for more than three days without prior approval will be subject to $30.00 per day storage.